The problem with "the science" is that the peer review is all opinion. It isn't like observing a chemical reaction that can be repeated dozens of times with the same result, where all reviewers would reach the same conclusion. None of us is evaluating the actual scientific method. You are basing your opinions on your trust of a reviewer who is giving their opinion and could be right or wrong (and is anonymous to boot!). What is the sensitivity of this analysis? Are the genetic factors from person to person, race to race and gender consistent? DNA analysis seems to yield results in the 99% or better accuracy range. Does the analysis in question rise to that level of accuracy? What is the metric of confidence in this analysis? I think if you say the analysis shows that the result is consistent with Earhart's body proportions, that doesn't prove to me that what they have found came from her. Just like with a piece of metal, you can only determine plausibility. It might be the same alloy Lockheed used, but many aircraft used that alloy. Unless the piece of metal can somehow be tied unquestionably to an Electra and hers was the only one in the region, it is just cognitive dissonance- i.e. wishful thinking. Generally, a minimum of 2 peer reviewers (up to 6) are chosen for the peer review. Peer reviewers are ideally experts in their field. Journals usually build a pool of peer reviewers that have a good track record of producing high quality reviews. Or they may scan the bibliography to identify potential reviewers or contact researchers they met at conferences and seminars. Many journals will first ask potential reviewers whether they are willing to review the manuscript before assigning them as reviewers. Editors have to be careful to select reviewers who have sufficient subject matter expertise to do justice to the manuscript. Therefore, highly technical papers or papers from niche subject areas may take longer to review, because it may take editors some time to locate appropriate reviewers. It appears that the peer review process of Dr. Jantz' paper is deeply flawed. Mr. Gillespie as a reviewer is not consistent with the peer review process as he has absolutely no credentials in forensic anthropology. And as the CEO of TIGHAR, one would consider he has a conflict of interest. Dr. King is an archaeologist and being a board member of TIGHAR, and one would consider he has a conflict of interest as well. We have no way of knowing the credentials of the unknown anonymous reviewer. In as much as this is a very new Journal (2018), there was apparently little to no one in the pool of reviewers with the credentials to competently review Dr. Jantz' paper. And if the unknown reviewer was competent in the field he/she didn't do any fact checking. "Editors have to be careful to select reviewers who have sufficient subject matter expertise to do justice to the manuscript." Outstanding summary of the errors in this articles "Scientific Method." First, participants on this forum have in fact outright dismissed Dr. Jantz's work and by inference his credentials and reputation and those of the peer review scholars and the scientific journal of publication. Second, Jantz's paper--in its entirety-which would include methodologies, integrity of data, scientific validity etc., has been peer-reviewed by scholars who are infinitely more qualified than anyone on this forum. After critiques were addressed satisfactorily the paper was then published in a prestigious academic journal. Again. You are incorrect and your claims are extraordinary. To dismiss a rigorously peer reviewed paper, authored by a respected subject matter scientist, as "garbage" takes a special kind of, uh, "confidence." You seem to have not read the paper and, or, are not familiar with the statistical and probabilistic techniques employed by Jantz. MOST REMARKABLY, you presume that the peer review process failed to reveal the most basic methodological failures and you presume the academic publishing house did not catch the failure of the peer review process. I'm sorry but there are some fundamental faults to your constant lecture of the "Scientific Method" here in the name of Tighar or in this case Dr Janz's work on their behalf. Dr Janz's Fordoc program is acknowledged as having limitations but lets leave that aside, and recognise that most of his new analysis relies on photogrammatic estimations of Earhart's height and also the lengths of her arm bones undertaken from analysis of old photographs by Jeff Glickman. There are apparent fundamental faults in the measurement accuracies claimed in Mr Glickmans estimates. Mr Glickmans earliest "claim to fame" was confirming super 8 footage of a 7' tall Bigfoot creature was real, which instead was later admitted by the creators to be of a 6' man in a fur suit. Not a great endorsement of credibility or accuracy. 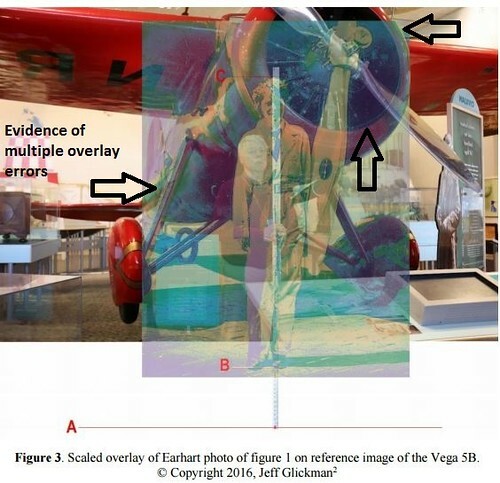 In Glickman's work at the NASM where he superimposes a picture of Earhart in front of her Lockheed Vega over a recent picture of the same aircraft now in the museum, he calibrates that superposition by aligning the engine cowl. Yet it is well documented that the aircraft has a different engine cowl in its museum display - he makes no allowance to the likely error that creates to his scaling factor - so much for the underlying "scientific method". Yet the cowling diameter is his scaling factor? 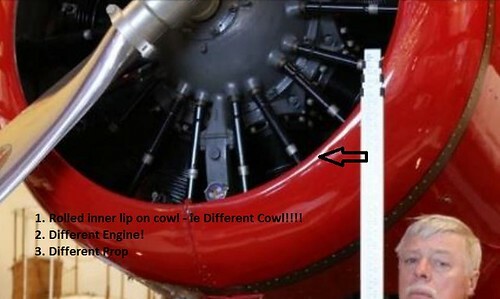 and not only is there a visible overlay problem, the historical cowl is not the current museum display cowl, and their internal diameters appear significantly different? The differences in the internal diameters of those two cowls is more than sufficient to render Glickmans height estimates to be worthless, yet Janz relies on it to support his Fordic analysis? - so much for the Scientific Method. Worse, then Glickman estimates the bone lengths within Earharts arm from beneath clothes and skin, and Janz relies heavily of that work to again support his fordic analysis. 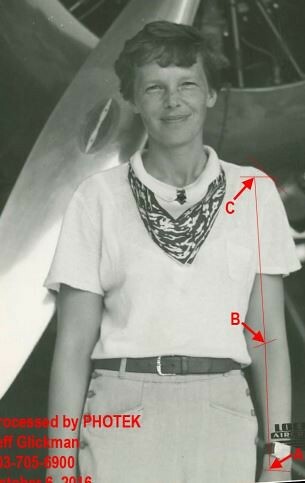 This is done once, on a single photograph of Earhart, where her arm is partially hidden by her shirt, and the ends of bones determined by fold lines in skin. 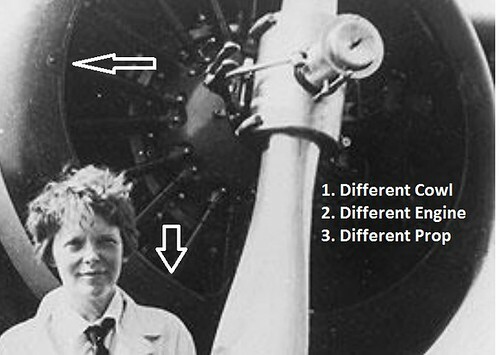 A true "scientific method" would apply and repeat this technique to a number of different photos of Earhart to demonstrate consistency of results, or alternatively - subject Glickman to a blind test of analysing the bone lengths from recent photos of 3 or 4 people in the same manner, and to then separately determine the real bone dimensions and ratio's of those 3 or 4 people through X-Ray. And to then ascribe a level of repeatability and accuracy to Mr Glickmans estimations. No such controls were applied - so much for the scientific method. However the BIGGEST failure of Dr Janz is to base the probability of these bones being from Earhart, (and not from one of the 8 missing crew members of the SS Norwich City ship wreck), is to ascribe confidence to his own work back on the "preponderance" of other evidence already showing Earhart had been on Gardner Island. The reality is we are certain those 8 missing crew members arrived on Gardner/Niku aboard the ship and did not leave with the survivors, - hence its quite possible one (or more) was badly injured and survived in the ship or was badly injured and was washed ashore elsewhere on the island and in anycase, left to become the castaway - there is no such certainty that Earhart was EVER on Gardner Island despite Gillespies claims to the contrary and the swallowing of such claims, unquestioned by Dr Janz (and before him Prof. Eagar). a very low probability of possessing that degree of similarity. posterior probability is 0.999 in both cases. So Dr Janz (like Proffessor Over Eager before him on authenticating the 22V1 as definitely being the "Miami Patch") swallows assurances from Tighar that the rest of their "evidence" is beyond doubt, where is it is all VERY DOUBTFUL. Janz' paper is hence built on a house of cards provided by Jeff Glickman. no data, no other specific missing persons have been reported. argument is that they are hers. 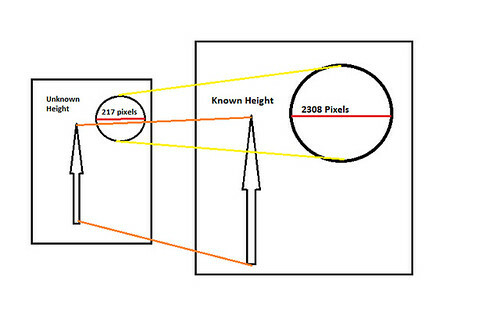 Where as ALL of that other Tighar evidence from Gardner / Nikumaroro Island has proven to be PREPOSTEROUS!!! and the bone ratio and height analysis by Jeff Glickman underpinning Dr Janz paper has similar serious flaws. Peer review doesnt mean someone has repeated the tests and endorses the conclusions, it merely simply means someone with experience in the field can follow the the scientific argument, not neccessarily endoses it. So yes, Dr Janz paper is peer reviewed by another forensic Anthropologist or similar qualification, but I suspect there is no qualified or peer review investigation of the issues I raise with Mr Glickmans work which forms such important foundational elements of Dr Janz paper? The reports produced by Mr Glickman to Tighar which are the source of Dr Janz information are not peer reviewed at all, and if they were, the issues and errors I have identified above would surely need to be addressed. By the way Ric, good health to you and Pat, its a pity your unwilling to permit such critical or skeptical debates over on the Tighar forum, and are unwilling to post under your own name here, or over on Aviation Mysteries. Agreed, and easily one of the premier "B*tch Slaps" I've seen on the internet in a long time. I'd also say that Mark's evidence to summarize that 'iowa61' is most likely no other than Ric Gillespie himself is much more concrete and believable than Jantz's paper. Mark can count me as one of his peer reviewers lol. I'd also say that Mark's evidence to summarize that 'iowa61' is most likely no other than Ric Gillespie himself is much more concrete and believable than Jantz's paper. Wrong!!! I can personally guarantee that iowa61 is not Ric Gillespie. Really?!!! ... then there you go. The first guarantee and concrete proof this thread has produced. Perhaps the guy will come back and 'man up' with an identity, or perhaps he'll just continue to remain an anonymous Troll .... which are the worst kind. His scientific paper has been peer-reviewed and published in a recognized scientific journal. These are the VERY HIGHEST standards of formal science. Extraordinary claims require extraordinary evidence, and Dr. Jantz presents that in unimpeachable form. All this is arguable. There was only one reviewer, who chose to be anonymous (in my experience, the most reputable reviewers allow their names to be included in the acknowledgements). The journal is in its first year, second issue, so has no reputation. There is a very wide range of journals - a pecking order if you will. Some are of the very highest respect, while others are "unimpeachable" crap. My general impression - one reviewer for such a controversial topic, authored and supported by people who have shown considerable bias - is that this journal is angling for the second group. The real question that needs to be asked is that if Jantz was confident about his "extraordinary science", then why did he not submit to a "recognized" journal -- he may well have, and worked his way down the pecking order. to get to where it was ultimately published. Reviewers typically don't "choose" to be anonymous. Again. There are well-established protocols for critiquing published scientific papers. Amateurs are welcome to take uninformed potshots, but they don't contribute to the science. Unlike you who typically chooses to be an anonymous Troll. I'm not sure who's more chicken sh*t, you or Mr. Block. worthless thread that needs to be locked up. Mark, as my dear departed Grandmother would say, "You're better to save your breath to cool your porridge!" I need to turn this third monitor off and keep it turned off. Last edited by Mark Allen M on Thu Mar 15, 2018 2:26 pm, edited 1 time in total. You are incorrect on this. Anonymous reviewers are anonymous because they specifically request that their names be known only to the editor. Most reviewers let the author know who is reviewing. This has been almost always the case in my experience (I have 60+ reviewed science papers, and have probably reviewed several times that many, over 30 years). Professional courtesy. (I have always let the author know that I am the reviewer, even where I have been scathing in my review, for how else is the author to know the credibility of the review). You clearly have more experience than I and I defer to it. Last edited by iowa61 on Thu Mar 15, 2018 8:27 pm, edited 1 time in total. Does anybody have the recipe for "Chicken Poop Soup?" ...By the way Ric, good health to you and Pat, its a pity your unwilling to permit such critical or skeptical debates over on the Tighar forum, and are unwilling to post under your own name here, or over on Aviation Mysteries. Thanks Mark! Pat sends her best back and says she forgives you for that time at the museum you threw up on her dress... the stains never came out BTW... what the hell were you drinking? No problem. We've just always been curious. And sorry, I don't recognize a post in a popular forum as a legitimate critique of any published scientific paper. There are recognized and well-documented protocols for critique; would love to see you go for it. The guy you outed as "Ric"